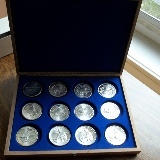 We consider the North and Northwest Alaska area to be all area North of the Yukon River from the point it enters Alaska from the Canadian border near Eagle and westerly along the Yukon River to the point it enters the Bearing Sea near Emmonak Alaska and all land belonging to Alaska to the West and North of this line. North and Northwest Alaska includes all the towns and villages listed on the left. Click a name to see more information. The Alaska North Slope is the region of the U.S. state of Alaska located on the northern slope of the Brooks Range along the coast of two marginal seas of the Arctic Ocean, the Chukchi Sea being on the western side of Point Barrow, and the Beaufort Sea on the eastern. The region contains the National Petroleum Reserve–Alaska, with the bulk of Alaska's known petroleum until the Prudhoe Bay Oil Field was discovered in 1968, as well as the Arctic National Wildlife Refuge, which itself has been the subject of controversy surrounding the possibility of petroleum drilling within its boundaries. The petroleum extracted from the region is transferred south by means of the Trans-Alaska Pipeline System to Valdez on the Pacific Ocean. Within the North Slope, only a surface "active layer" of the tundra thaws each season; most of the soil is permanently frozen year-round. On top of this permafrost, water flows to sea via shallow, braided streams or settles into pools and ponds. 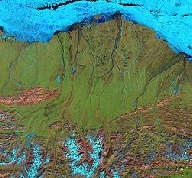 Along the bottom of the Landsat 7 image on the right the rugged terrain of the Brooks Range mountains is snow-covered in places (blue areas) and exposed (pink areas) in others. Much of the region is located in North Slope Borough. North and North West Alaska includes all the cities, towns and villages on the left. Click a name to see more information.